I woke up at 7am and flopped around the house for a bit before heading out for a run. It was a beautiful clear morning and I went around the back through all the corn fields and cultivated fields of stuff that I don’t really recognise. I followed some winding little tracks through the forest before turning around and heading back to the village. On the way back Anna called so I stopped and chatted and ended up strolling back at a leisurely pace. After breakfast I got myself ready to head to Alpine Spring (I think), a European styled village that Eugenia is keen to visit for some research. Ludviga and Gaodaqiang showed up and we all jumped in the car. The village was this bizarre housing development with a Victorian era style hotel and a whole series of empty shops with photoprints in the windows to make them look full. The whole place was completely empty, lot’s of empty houses and shops, I’m pretty sure that it was super expensive to live there. It was full of Grecian marbles and statues of Strauss and Mozart, as well as a whole row of restaurants with European themes like The Agean Sea and The Yorkshire, none of which had ever been opened or used at all. We had lunch at a little restaurant that seemed to be the only place with life in it and got the hell out of there. We headed into 798 for Silja and Christina’s show, it’s a 45km trip that took 2 hours in the dense traffic. We got there right on 4 for the opening but Justin, Eugenia and I were dying for coffee so we ducked out for a take away first. On the way we dropped into Pace Beijing to check out a Sol Lewitt exhibition. We got coffee and headed back to the opening for a while. Afterwards we wandered around to check out some spaces. There were some amazing marble carcasses by Christian Lemmerz next to Pace and a pretty awesome show of video works by Lee Nam Lee at White Box. 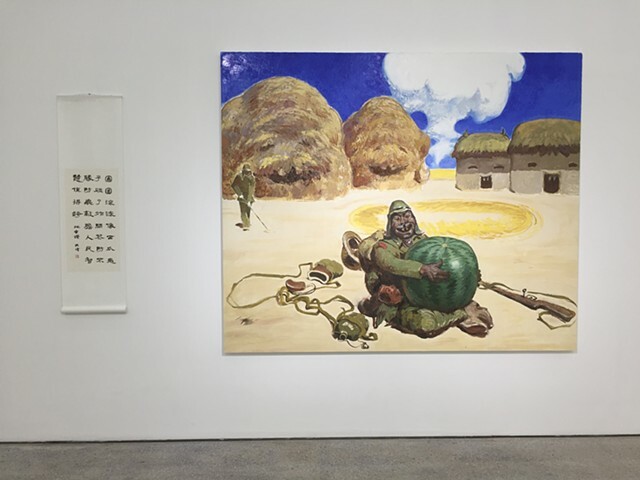 A highlight was a solo show of paintings called Honour and Disgrace by Wang Xingwei at Platform. Crazy kind of cartoon approach to brutal imagery of the Japanese occupation. We met some of Gaodaqiang’s friends and checked out a new gallery space that was in the process of installing a show. We headed back to the car and embarked on the long haul back to Huairou to drop Eugenia off at the farm and go get some dinner in a little restaurant in town. It was a long day not doing too much and now we’re back at Shen’s flopping around the house again. I’m going to pack some stuff for a couple of nights in Shenyang with Justin and work out how to get a taxi from here to Beijing South Train Station in the morning.